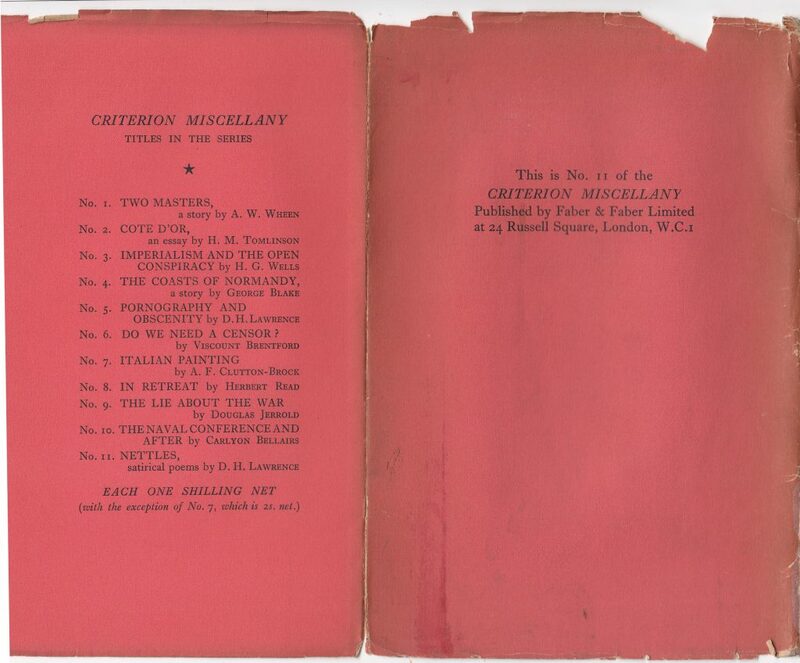 The Criterion Miscellany series consisted of short works (30 to 60 or so pages) by authors and public figures active in the late 1920s and early 1930s in the UK. It was an offshoot of the journal Criterion, edited by T.S. Eliot from 1922 to 1939. The series did not contain reprints from the Criterion, instead, the series included new works. Given Elliot’s editorship, and the inclusion of some important authors in the series (Joyce, Lawrence) the series has some literary and historical value. There were a total of 43 numbered titles, the first published in 1929, and the last new title issued in 1936, with occasional reprints until 1987. 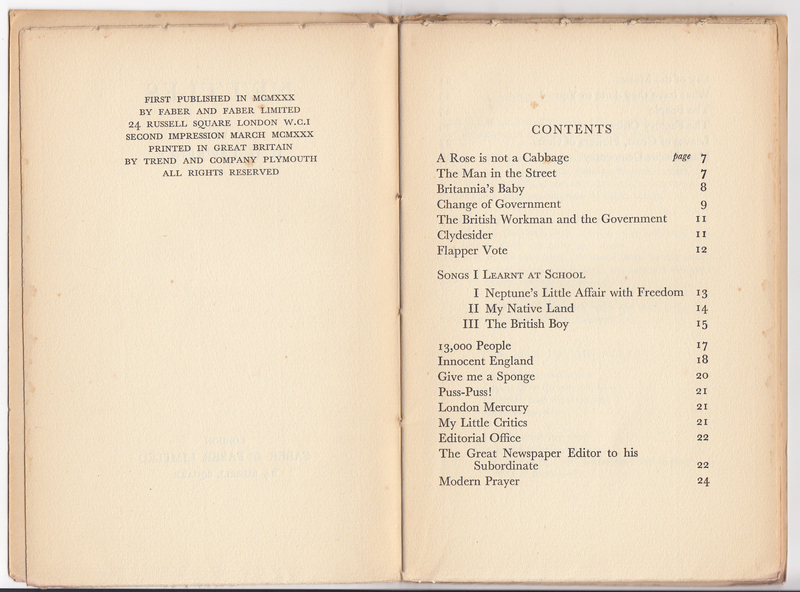 1929 was also the first year for Faber and Faber, the publisher. According to an article by Alan R. Nourie entitled “The Criterion Miscellany: A Lost Series,” Eliot solicited some contributions (as he did with the Criterion) for the series and was heavily involved in editing some of the manuscripts. Literary critic Herbert Read (who wrote #8 and #16 in the series) served as an unofficial assistant editor for both the Criterion and the series. He also solicited some titles for the series. Finally, some series titles were suggested by Faber & Faber, based on unsolicited manuscripts they received. The Criterion and the Criterion Miscellany were to some degree related: 12 of the 37 authors represented in the series were also published in the Criterion. The series ended in 1936, after publishing only 3 new titles since 1933. To break even, a title would have to sell 10,000 copies. The best seller’s in the series were Anna Livia Plurabelle, by James Joyce (selling 10,166 copies) and Haveth Childers Everywhere, also by Joyce (selling 5,590 copies). 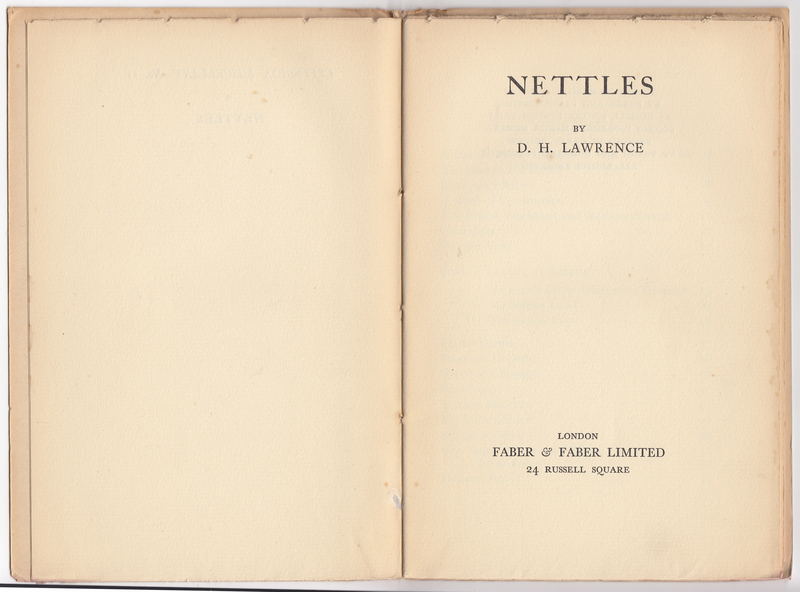 Lawrence’s Nettles also sold around 5,000 copies. Thus only one title sold enough to recover costs. That the series continued as long as it did is somewhat surprising. Jackets are common to the series, with a few exceptions (which follow the same general design but include a graphic element at the center of the front of the jacket: #15, #28, #31 and #43). 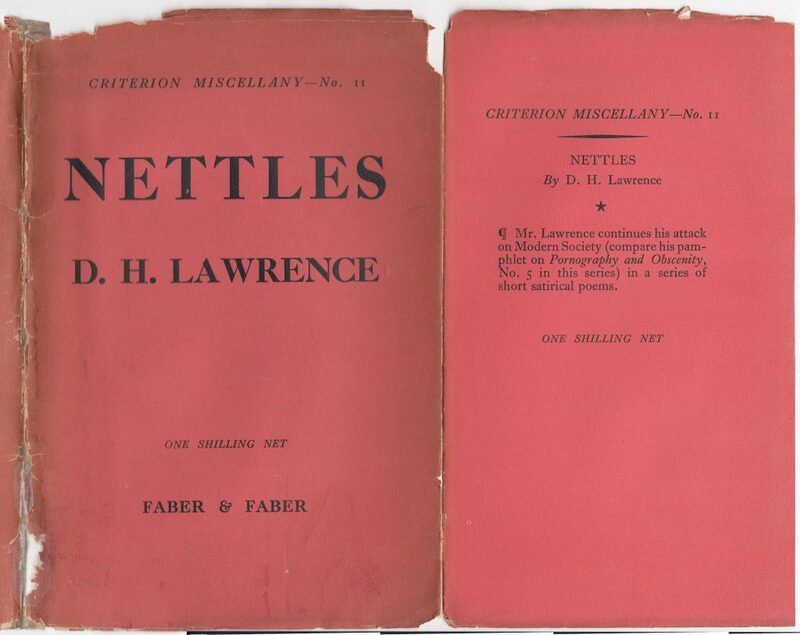 D.H. Lawrence’s Nettles consists of satirical poems and was published as #11 in the series in its second year (1930). There is no printing on the spine as there is no spine on this card-bound pamphlet. The series name is included on the front of the jacket, as is the series number. The price (one shilling) is also printed on the front of the jacket. The front jacket flap repeats the series name and series number and price and includes a brief summary of the title. A list of titles in the series is below. * According to an article by Nourie (see above) these titles were also issued in hardcover. The rear of the book also includes the series name and series number of this particular title along with publisher’s information. A list of the first 11 titles, up through Nettles, is included (with the price again) on the rear jacket flap. I have seen one title with a paper band rather than a dust jacket, and a printed cover. This and many, copies of the Criterion Miscellany are bound in boards with no spine. A few titles are bound in cloth. There is no printing on the boards. The book lacks a half-title page. The title page includes title, author, and publisher information. 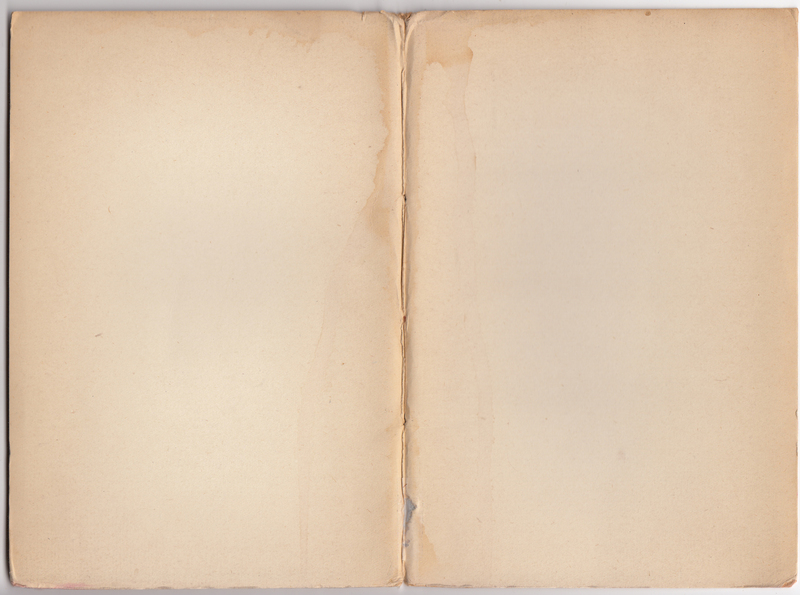 The copyright page indicates first publication in 1930 and this copy, the second impression in the same year. Books in the series do seem to include all subsequent printings, so it is easy to tell if you have a first or subsequent edition. The book was printed by Trend and Co., Plymouth in the UK. 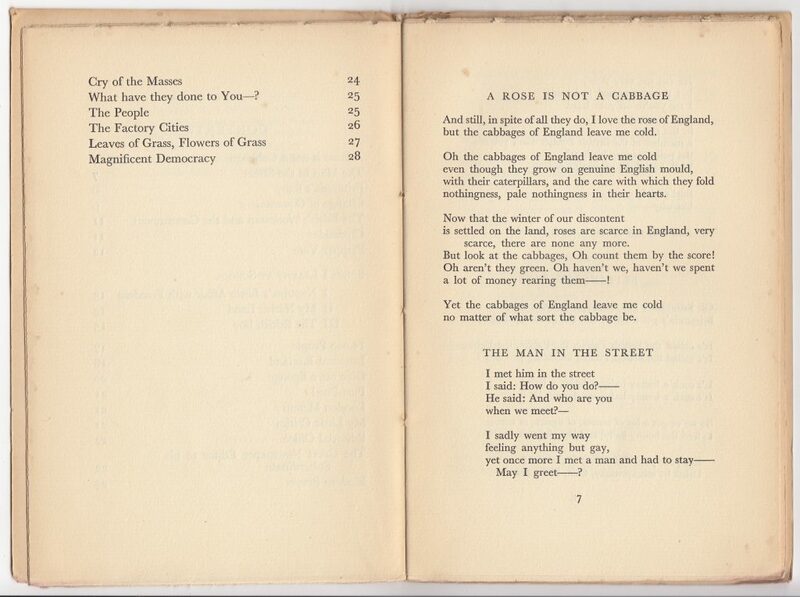 The first poem, after the contents.